There is a very good reason that the part of Burgundy between Dijon and the beginning of the Cote Challonaise is referred to as the Cote d’Or or Golden Coast, and it’s not because of the colour of the leaves in Autumn. It’s because the greatest and most aught after wines in the world are from this mysterious and unattainable part of the world, crafted from only two varieties, either pinot noir or chardonnay. These are the benchmarks not only for wines made with these grapes but all wines, particularly cool-climate elegant wines. I visited here as part of my 2010 trip, only spending a total of three days which included one in Chablis. With so little time back then I ended up visiting three negociant style houses based in Beaune and only one small producer in Volnay, but none in the Cote des Nuits although I did taste wines from this area. When I drove back from Dijon to Beaune after my visits in Chablis I passed all the vineyards that have such mythical names, realising just how small the appelations are. Some domaines own many hectares of vineyards in a multitude of different appelations and buying fruit or wine to make up the difference, releasing 50 or more wines each year. Other domaines are pure proprietors who only make wines from their own meagre holdings less than 15 hectares, often within one village. The difference between these two types of burgundy houses can be profound as I discovered on my first day in the northern part of the Golden Coast. 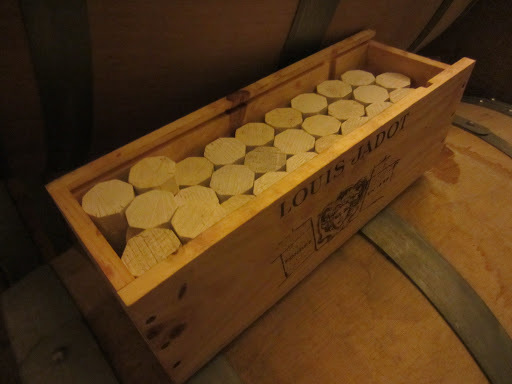 Louis Jadot is one of the biggest grower/producer/negociants in Burgundy and without question one of the most important. The winery itself was established in 1859 but the origins date back to 1826 when the first vineyard was purchased in Beaune. This was following a period when there was significant acquisition of vineyards during the Napoleonic era when land was reclaimed from the church or the crown. More vineyards were purchased following two more tumultuous periods in Frances viticultural history; namely the phylloxera epidemic that swept across Europe, and then following the years of economic depression and the second world war when vineyards were abandoned or sold. Today Louis Jadot owns 154 hectares throughout Burgundy from Beaujolais to the Cote des Nuits, including many parcels in premier and grand cru appelations, and also purchases grapes and wine as a negociant. The vast majority of the wine is exported and is possibly one of the widest distributed in the world, preferring to be stocked in the finest stores and listed in the best restaurants. Their marketing and sales strategies are unparalleled in the region and set the standard for portfolio balance, quality to price ratio and market penetration. Much of the clout behind the business comes from the American Kopf family who have made significant financial contributions that have led to a lot of modernisation and expansion in the wineries. Domaine Louis Jadot was one of the wineries that I visited back in 2010 having stocked many of their wines in the store without actually tasting that many nor really understanding them. I met Frederic Barnier who is the man who is set to take over from Jacques Lardier who at the end of this year will retire as chief winemaker after 42 consecutive vintages. In July of 2010 the wines, particularly the pinot noirs, were still going through malo-lactic fermentation, and the barrels were quietly bubbling away as we tasted the 2009 wines. I remember being very overwhelmed as wine after wine and appelation after appelation were tasted in such a short period of time, but I do remember thinking the wines were amazing, particularly from this vintage for the red wines. This time I was hosted by Christine Botton who is one of the other oenologists and she was able to reintroduce me to the facilities. Outside of the historic Beaune centre is anything but historic, very modern and clean with heaps of space above and below. You lose a little charm being in these cellars compared to others that date back hundreds of years, but such is the price of expansion and modernisation. 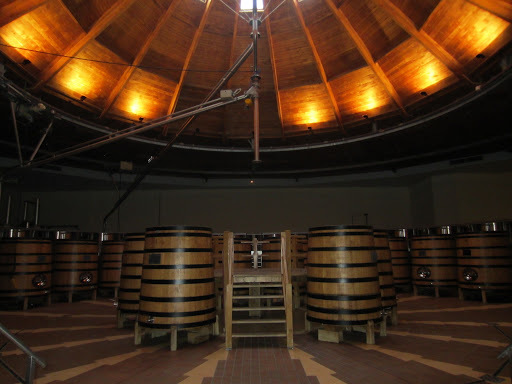 With the winery producing over 100 wines per year they need a lot of different tanks for red and white wine, and even more barrels for the malo-lactic fermentation and subsequent ageing. Returning with a great deal more experience under my belt made me realise how difficult it must be making so many different wines, but also that in my humble opinion the wines are not made differently enough (a difficult task admittedly) and appelations taste a little too similar, with a fairly heavy maceration on skins and quite a bit of new oak. 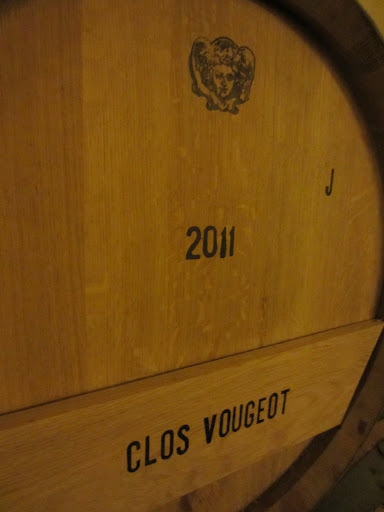 My return to Jadot was not the same as the first visit, and I was far from seduced by the experience or the wines. Click here to read my tasting notes. After stopping for a sensational lunch at nearby La Ciboulette (which I also visited in 2010), I traipsed back up the Cote des Nuits all the way to Gevrey-Chambertin which is the northernmost appelation in the Cote d’Or before Marsannay and then Dijon. From a producer owning over 150 hectares in up to 20 different parts of Burgundy I visited a producer owning and working only nine hectares just within Gevrey-Chambertin (therefore only making red wine). 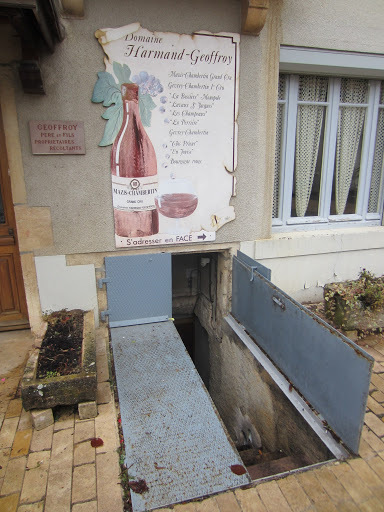 The cellars of Harmand-Geoffroy are located in the heart of the village of Gevrey-Chambertin, very modest and discrete, and are producers that when any of my preceding hosts heard the name they didn’t know. It was another estate recommended by my very good friends at Europvin, but for some reason the name triggered something in my brain, convinced I had heard it before. It wasn’t until well into the tasting that I realised how I knew it, when I asked if they had an importer in Australia and I was informed it was the sensational Bibendum Wines. Considering how the visit was going everything clicked in my brain, and I now remember that I actually stocked some Harmand-Geoffroy wine in the cellar at the shop, hence why it stuck in my brain. Like most of the burgundies I was selling however, I had never actually tasted their wines. Thus by sheer accident I ended up visiting so far my favourite and best producer in Burgundy in my opinion. I was welcomed by Gerard Harmand and taken through a tour and tasting by his son Phillipe, who both run the nine hectares themselves. Everything about the experience was both charming and exactly agreed with my now quite particular and (some might say) eccentric philosophies about what wine should be. 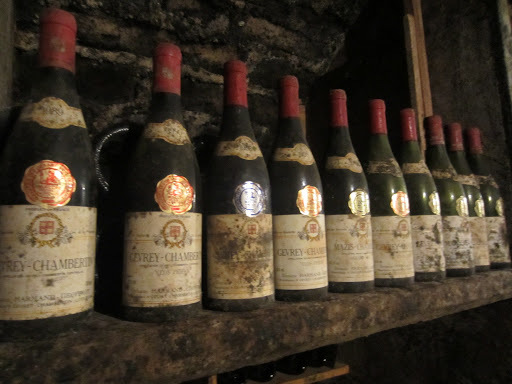 Firstly we went into the cellar which is across the road from the winery, and I had the (uncommon in Burgundy) chance to taste not only wines from bottle but ones with a few years on them. Phillipe and Gerard were generous enough to show me most of the cuvees from the 2008 vintage, which is an underrated one for red wines in my opinion, as it tends to have a very classic structure with firm tannins and good acidity compared to the 2007 and 2009 vintages which are generally fuller and softer with more generosity. Tasting all from the same vintage was a great opportunity to see how the different vineyards expressed themselves, which is particularly important for the nuances of how Gerard and Phillipe express their terroir. They ape the ‘Parker’ style of heavy maceration and extraction and propensity for more oak, aiming to retain freshness and elegance and allowing the wines to be more delicate whilst showing their subtlety as they age. In my opinion this style of wine not only better reflects the subtlety of the terroir and grape variety, but also makes them both approachable when young with huge aging potential, and better with more delicate food. I also got to try the 2009 and 2010 vintages of the monopole La Bossiere wine to show the difference between vintages, with the 2010 being the best burgundy I have ever tasted. I was further enthused when I saw that they use some cement vats for the fermentation, which has become a bit of an obsession with me during my trip. The style and finesse of the wines from Harmand Geoffroy couldn’t be more different to the bold and dense expression of Louis Jadot, but the great thing about wine is that people can have different tastes and neither style is wrong necessarily. Click here to read my tasting notes. Click here to see more photos from my first day in the Cote des Nuits.